For the past few months, our spare bedroom (which functions as my office/dressing room) had been overrun with wedding gifts. It was literally where Crate & Barrel boxes came to die. When the afterglow of the honeymoon faded, my first “back to reality” task was to unwrap, unpack, and CLEAN. Did I wear this within the last 6 months? Is it classic enough to outlive trends? Can I style this for work? Basically, being an old married woman has reminded me that it’s time for my closet to grow up. I need to age gracefully and let my wardrobe reflect a more mature phase in my life. Finally let go of the little bodycon dresses I used to wear during even the brutal winters of Chicago in college. Set aside my pride and subsequently the jeans that my skinnier self wore two sizes ago. I tossed the once-trendy, brightly-colored Forever21 pieces in favor of my classic neutral shirts and dresses. 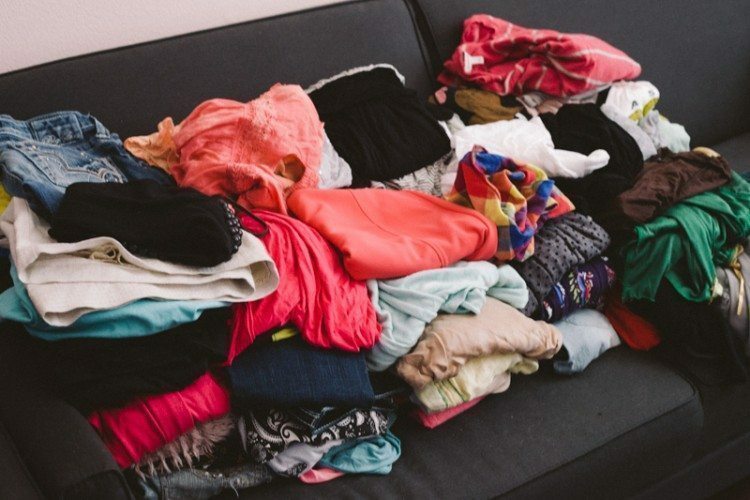 It took a few rounds and self-control, but eventually I ended up with piles of clothes to giveaway stacked on my couch. Decided to donate them to Operation Kindness, which is a local no-kill animal shelter. My dog, Zeus, approved of this decision and helped me pack. I was left with lots of closet space and a clean office/dressing room. I purchased this garment rack from Container Store and got a great deal on the dress form from a boutique that was going out of business. I also snagged 50 wooden hangers from the boutique for only $25! Zeus is so cute! There’s never enough time to clean and organize everything (at least at our house). This is an awesome start. I think I’m only hanging onto clothes that are one size down…so that I don’t find myself with nothing to wear in case I unexpectedly drop a few pounds. LOL!! Our wedding gifts were all mine, too. Holden’s idea of cooking dinner is microwaving easy mac. I’m letting him use the gift money towards his outdoor mancave, to even out the score.